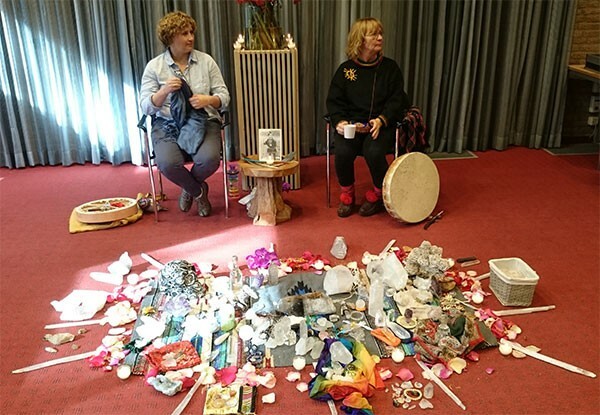 Yesterday I went to Lunteren in the Netherlands to participate in an event to honor and charge the last of the 7 Sacred Crystals that Kiesha Crowther, as one of the 12 keepers of Mother Earth, is the guardian of. To fill it with our loving thoughts and prayers. It was so moving and impressive. Let me tell you all what happened. In the hall where we all gathered, I think there were 100-150 people, was a little carpet on the ground. On that little carpet Kiesha had placed the last of the 7 Sacred Crystals. And some rose buds and lights. 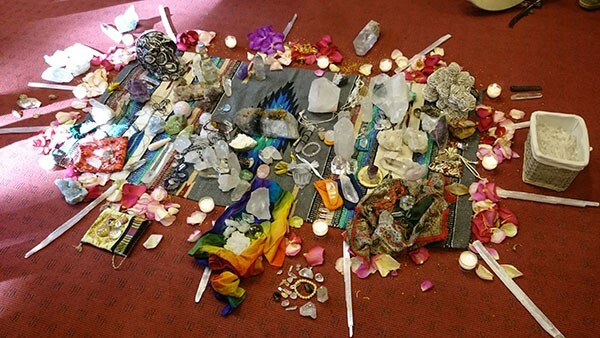 We were asked to put our own crystals on that little carpet too, so that they could connect with the the big Sacred Crystal. This last of the 7 Sacred Crystals will be put back in Mother Earth in Peru in a couple of weeks. The afternoon started with Grandmother Signe. She is a Sami, coming from the North of Norway and she is a Shaman. She told us her story. That her people and their talents were suppressed for a long time. She was still very sad about that. But nowadays she can use her talent as a shaman and since 5 years or so she works together with Kiesha to help Mother Earth. After a short break Kiesha continued to tell us about the Crystals. She is the guardian of 7 of them and already 6 of them were placed back in Mother Earth. The second ceremony for instance was in Sweden and Kiesha told us, that that was a very special ceremony. The women had to feel all the sorrow and grief from all the women in the world in the past and the men too. Very intense. There were also Sacred Crystals put back in Maui, Egypt and Holland (6th). The one in Egypt was placed in the piramyd of Gizeh. Kiesha also says that if you are connected to Mother Earth you can experience dizzyness, nausea and headaches. All symptoms that Mother Earth needs our help. According to Kiesha a drum is very powerful. It is the heartbeat of Mother Earth. So she suggested that we all go out into the forest and search a place where we want to stand. We did and everybody with a drum started to drum. First 3 drums to connect with yourself and Mother Earth, then drums to connect with the ancestors and then drums to connect and give back to Mother Earth. It was an amazing feeling! After a while we gathered around Kiesha and Signe and Kiesha asked if somebody wanted to share a song or something else with Mother Earth. Some of us did. There were some really moving songs and prayers. Then we went in and had a little break again. After the break Kiesha started with the ceremony for the last of the 7 Sacred Crystals. We gathered around the Crystals and somebody was chosen to represent the North, the East, the South and the West. We then all faced the North and Kiesha and Signe started their prayers. We also did that for the East, the South and the West. Then Kiesha and Signe said some more prayers. After that we could all send our prayers to the big Crystal. And then the helpers, that will go with Kiesha to Peru to place the Crystal back in Mother Earth, were asked to come forward. They gathered around the big Crystal and there were prayers again. After that the big Crystal and the ones that will go to Peru too were packed and put in a bag to keep them safe and protected. And we were asked to come and fetch our own crystals again. Two of the people present had a large bag with crystals and they offered us to take one with us. Kiesha said it would be a good idea to put one back in a river or lake or sea in Mother Earth again. It was an amazing and very loving afernoon. Lets all continue to heal Mother Earth!